Measuring instream flows on Deadman Creek in Spokane, WA. Washington State is in the middle of a grand experiment in watershed planning, spawned by the realization that water supplies need to not only sustain growing populations but also maintain healthy ecosystems. In the face of apparent diminishing water availability, this experiment is being conducted in 41 of 62 Washington watersheds and is funded by the state. Development of watershed planning legislation in Washington State in the 1990s started with an almost exclusive focus on addressing the water quantity question: how much more water can be handed out? As the legislation took shape, the listing of salmon species under the Endangered Species Act (ESA) and state obligations to address water quality concerns under the Clean Water Act loomed. As a result, state legislators and regulators added habitat and water quality as optional components of watershed planning. Establishing minimum instream flows was also added to the list of options to address. Under the new state law, watershed planning is initiated by the counties, the largest city and the largest water provider in the watershed. Tribes are also invited to participate, and together they form the core of the watershed planning coalition known as the “Planning Unit.” Planning Units are defined in state law, but they are not part of state government. Typically, a county acts as the administrating and coordinating agency. Other stakeholders, such as industry, environmental, agriculture, forestry, recreation and citizens, may join either as individuals or caucuses depending on the organizational and decision-making structure chosen by that planning unit. Most planning units govern by consensus, which requires strong leadership to keep the process moving. Watershed Planning consists of four phases: organization, data collection and technical assessment, plan development, and implementation. Watershed Planning Units have four years to complete their assessments and develop a plan once they accept funding for their effort. The first plan in the state, the Nisqually Watershed Management Plan was formally adopted in April, and more are on the way. The state has committed some implementation funding, and the top priority projects and management strategies included in each watershed management plan are expected to be implemented once each plan is formally adopted. After Watershed Management Plans are adopted at the local level, they are forwarded to the state for final adoption and possible rule-making. Watershed processes that affect the water resource vary widely over the state due to differences in climate, landscape, degree of urbanization, economic development and the stakeholders involved. As such, scientific studies and assessments that support each plan vary, and can include instream flow needs assessments, water rights analyses, evaluation of water reclamation and water storage potential, simulation of hydrologic processes, development of water quality monitoring plans and databases, and more. A central element of each plan is a technically defensible “water balance” that indicates how much water is available in the watershed and how much the Planning Unit determines is needed (for both in-stream and out-of-stream use) now and into the future. Climate change is also a factor in determining future water availability. Cooperative development of strategies to preserve the resource often involves facilitating the stakeholders in the watershed, each of which has differing views and water needs. After addressing minimum grant requirements, planning units have a large degree of freedom on what to focus on, and that focus varies tremendously between watersheds. Golder Associates Inc. is involved in both the technical assessment and the development of the management plans for over a dozen watersheds in the state. 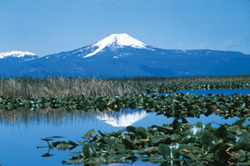 The following examples, the Nisqually and Spokane watersheds, represent two very different regions in Washington State. The Nisqually Watershed Planning Unit completed and formally adopted a watershed plan in April 2004, and is proceeding with implementation. The Spokane Watershed Planning Unit is scheduled to complete its plan later this year. Because watersheds follow hydrologic rather than political or jurisdictional boundaries, it is common to have multiple cities and counties represented in one watershed planning effort. In this case, an Indian Tribe, three counties, five cities and towns, three additional water purveyors, citizens and river council representatives, agricultural interests, development interests, a military base and a national park worked together to determine the key water-related issues in the watershed and develop solutions to address those issues. This is the only watershed in the state where a Tribe has served as lead agency in the planning effort. It is also the first plan to be formally adopted by the legislative county bodies and acknowledged by the State. The 720-square-mile Nisqually Watershed is unique in the Puget Sound area because the watershed environment has remained relatively intact and healthy despite its proximity to higher density urban land uses in Olympia and Tacoma. It boasts a number of native salmon runs, a large protected estuary, and a wide range of habitat values generally characteristic of areas more distant from the fast growing Puget Sound region. However, the watershed is currently poised to experience significant pressure on its natural resources. Population growth is expected to result in water supply shortfalls for the cities of Yelm and Lacey and the Town of Eatonville in the next decade if new sources are not found and water rights are not granted by the State. Recommended actions in the plan focus on the most predominant or key challenges in the watershed, as determined through Planning Unit workshops. These challenges are organized into five central themes: growth and land use, groundwater resources and supply, water rights, instream flow, and water quality. Challenge: Several major cities and towns draw supply from sub-watersheds that are closed to further water appropriation due to instream flow concerns. These municipalities predict water supply shortfalls within the next five to ten years if new water rights are not issued by the state. The growth targets for these areas, as mandated by the state Growth Management Act (GMA), will be difficult to meet without additional water rights. Possible development of a regional groundwater supply that could meet drinking water needs and protect freshwater salmon habitat. Increased efficiency in processing water rights applications by batch processing them by sub-watershed and recommending mitigation strategies for water right applicants in areas that are closed to further appropriation. Considering water supply availability when counties and cities make land use decisions or amendments to urban growth area boundaries. Use of county-wide coordinated water system planning to evaluate water supply and demand at a more regional level. Challenge: Instream flows are insufficient to meet the needs of salmonids in some tributaries to the Nisqually River, and as such some sub-watersheds have been closed to further allocation of water rights. Instream flow study to evaluate the flow needs of salmonids in a tributary to the Nisqually River. Explore the use of seasonal excess flows for aquifer storage and groundwater infiltration and later use of that water to augment flow in low-flow tributaries. Challenge: Lack of consistency and coordination in data collection efforts for water quality. A web-based system allows all residents of the basin access data about their watershed, including water quality, monitoring programs and historical data. The plan takes the form of a flexible, working document that identifies projects and programs to be implemented over time. Funding for implementation is a major challenge; however, the state of Washington has committed $100,000 per year for the next three years to assist in implementing projects and policies identified in the plan. Golder has already completed the water quality monitoring plan and the web-enabled water quality data base. The ability of the varying stakeholders in the Nisqually to use the state watershed planning process to make positive strides in addressing water resource issues sets a positive example for the many other watersheds. Yet the process is by no mean easy -- the Nisqually group learned that it is difficult to make decisions regarding political water issues, and far easier to keep requesting more scientific data while putting off the harder decisions. As such, significant time and budget can be spent on collecting and evaluating data, leaving little time to develop and agree upon strategies that will ultimately preserve the resource and optimize its use for both in-stream and out-of-stream purposes. The Little Spokane watershed has minimum instream flows that were established in 1981 for protecting fish habitat that effectively close the watershed to further issuance of any water rights. The Middle Spokane watershed is upstream and hydraulically connected to the Little Spokane watershed through a major aquifer. Because of this hydraulic connection, and because the administrating agency (Spokane County) covers most of these areas, these two watersheds pooled their resources for watershed planning. The watersheds cover approximately 1,000 square miles in Eastern Washington on the border with Idaho. Average annual precipitation ranges from an arid 15 inches a year in the west to 45 inches a year in the east. The City of Spokane urban area is the major population center, with the rest of the watershed being sparsely populated. Most water use is for residential and municipal purposes, and recreational and environmental values rank high. Flow in the Spokane River is influenced by operation of a hydroelectric dam and management of theassociated Coeur d’Alene Lake, which are both upstream and outside of the watershed. Only one-third of the water rights are actually being used, and there are already concerns about the impact of that level of use. Over the past century, aquifer levels in the Spokane Valley have remained stable, but the summer low flow in the Spokane River has dropped by about 50 percent. Half of the water used for municipal and residential use is applied during the summer for outdoor yard and landscape irrigation in this hot country. 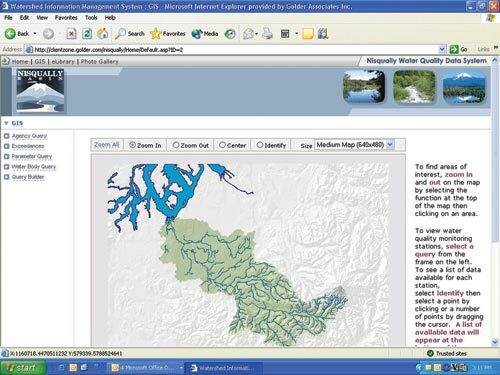 The technical approach adopted by the Spokane watershed planning unit was to develop a fully integrated deterministic watershed simulation model. The concept was that once such a model was developed, it could be used to evaluate the effects that current practices have on the watershed and the effectiveness of a wide range of alternative management scenarios to attain desired effects. The MIKE SHE software from DHI, Inc. was used, which is an integrated surface water and groundwater modeling program. This software has been used in several large scale projects such as restoration of the Florida Everglades, management of the Danube River, and the federal Rocky Flats facility in Colorado. The Spokane project was the first full application of MIKE SHE in Washington. A major issue in the Little Spokane watershed is the existing minimum instream flow regulation. Most water rights issued since the establishment of those regulations are interruptible when regulatory streamflows are not met, and Ecology has issued letters every few years to those water right holders directing them to stop exercising their water right for weeks or months during critically low flow periods. The degree of compliance with these “cease and desist” letters is unknown – after all, how can you expect individuals to stop using water that they depend on for drinking or for their economic viability? Many people believed that the instream flow regulations were arbitrarily set without proper science being considered. In fact, they were set based on flows that were met four years out of five in the historical record, and results in streamflows that are guaranteed to statistically not meet the regulatory standard every one in five years. Changing climate conditions (e.g., global warming) may also change the frequency that regulatory flows are not met. In response to this concern, the watershed planning unit commissioned a fish habitat study to evaluate the biological relevance of the instream flow regulations. Scoping meetings were held with the stakeholder group and appropriate agencies (the Washington departments of Fish & Wildlife and Ecology). 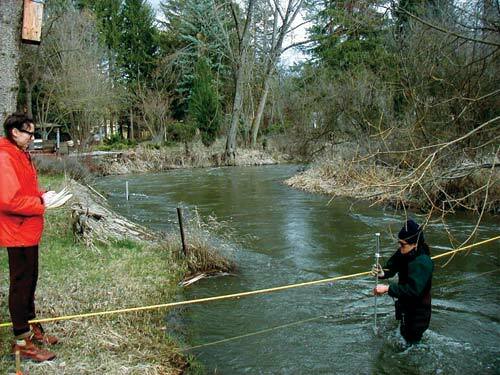 Fish habitat at various flow levels was measured at multiple sites on the mainstem. The results found that the regulations were reasonable in the context of biological needs of the fish – perhaps coincidentally so. Regardless, the Planning Unit put to rest the contention that the regulations did not relate to biological benefits, and discussion was allowed to focus on more tangible variables. Identifying ways to ensure the flows in rivers and streams are adequate to sustain a healthy environment for fish. There are also several influences that fall outside the scope of the Watershed Planning Unit. These include water resource management immediately upstream of the watershed in Idaho (interstate issues), and relicensing of five hydroelectric dams by the Federal Energy Regulatory Commission. Where Does It Get Us? Watershed planning in Washington State began with the purpose of ensuring the environmentally responsible provision of water for future needs. And after investing approximately $32M and counting, the State Department of Ecology will be looking to have this purpose fulfilled. Significant credible work has already been conducted in the various watersheds, including establishing direct communication among stakeholders with divergent purposes, developing broad consensus within individual watersheds on the important issues and variables, consolidating data sets in a single location, and raising the level of awareness of the participants and the community at large. Creating substantive plans will be challenging given the level of initial communication and agreement between stakeholder groups, and the four-year timeframe required to produce a plan. It will be interesting to see the divergent plans that will be proposed, to a large degree developed independently, by each of the watersheds. For more information, contact Chris Pitre or Lisa Dally Wilson, Golder Associates Inc., 18300 NE Union Hill Rd, Suite 200, Redmond, WA 98052 (425)883-0777, Fax (425)882-5498, email: cpitre@golder.com or visit LDallyWilson@golder.com.